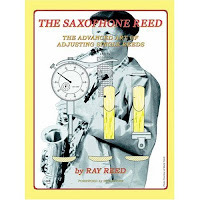 A few weeks ago Mark Sowlakis, my buddy and regular contributor to this blog, called me and told me about the great results that he and other sax players he knew had been having with a new reed adjusting tool called the ReedGeek. Mark said that he had gone from being able to play just three to four reeds in a box of ten to playing six or seven out of a box. That sounded like a pretty big claim, but I do trust Markos so I figured I would give it a try. I send Mauro at ReedGeek a message and he agreed to send me a few ReedGeek tools in exchange for a banner add on this site. I usually only can play three or four reeds, if I'm lucky, out of a box of ten. These odds are roughly the same as playing online Bingo. I do have a tendency to enjoy gambling, but if there is any way I can avoid wasting so much bread on little shards of cane then I will jump at the chance to improve my odds. The idea of the tool does make a lot of sense because a warped reed table is one of the most common reed problems and the ReekGeek is a simple solution to warping. Even if a reed starts out playing great, often it will die due to a convex or concave table warp. I learned this from Ray Reed's great book The Saxophone Reed: The Advanced Art of Adjusting Single Reeds. The ReekGeek tool is a perfect way to flatten the reed table without removing too much material, as often happens when using a reed knife for this delicate operation. The tool also is great for adjusting side rails. I gave up trying to get results with a reed knife years ago, since I usually would end up just killing every reed I would touch with it. So far with the ReekGeek tool I have gotten many reeds to play that would have been destined for the reed boneyard. I have had particularly good luck with tenor reeds that were just too hard and stuffy. I was able to remove a small amount of material from the back of the reed in order to make the entire reed a bit softer. This adjustment strategy for me in the past was done with a tool made by Vandoren, which was small piece of glass mounted with sandpaper. This almost never worked because it was just too hard to manipulate the reed on the sandpaper and I would always end up sanding too much off the bottom of the reed. So I am not yet getting six or seven playable reeds out of a box of ten from using the ReedGeek tool, but it has definitely proven itself to be a valuable new tool for reed adjustment and it has saved many reeds that were effectively DOA. I plan to experiment more with the rail adjustment feature in the future and I'm sure that in a short amount of time the ReekGeek with save more than enough reeds to pay for it's cost. The ReedGeek “Universal”® Reed Tool enhances reed performance by rapidly and accurately flattening reed tables. Within 10 minutes of training to use the tool, players will notice a dramatic improvement in efficiency (ease of sound production), sonic quality and responsiveness in their reeds. Users of the tool will find more “good” reeds in a box and the reeds will perform longer and more consistently over their lifetime. The blade at the tip of the tool has a gentle radius that can be used for precision scraping, including balancing the tip, adjusting the heart or other fine adjustments. The radius allows single-point contact for scraping very precise areas of the reed quickly. On each side of the scraper blade, there is a blade designed especially to adjust or modify the rails of the reed. These blades quickly define the desired rail profile. Most commercial reeds will have or develop lateral warpage of the reed table either from the factory or when the reed comes in contact with moisture. In this defective state, the reed will not seal correctly along the critical area of the mouthpiece. This area extends along the mouthpieces side rails to just below where the mouthpiece window and table meet. When the ReedGeek is properly used in daily reed maintenance and reed preparation, the reed and mouthpiece will perform much more cohesively as a unit. This unit will have the reed positioned snugly against the mouthpieces’ table, side and tip rails creating a temporary vacuum.It is this vacuum and subsequent release (pop) that maximizes the vibration and response of both the reed and mouthpiece, contributing to improved tone quality, articulation, and control. The ‘Geek can also be used to balance both the rails of the reed and the tip by using the rail blades and the scraper radius. The two main reasons for poorly performing reeds are: 1. Reed Warpage and 2. Imbalances at the tip and side-rails. As you know the ReedGeek is very effective in dealing with the warpage on the bottom of the reed. Again, always address the area of the reed that corresponds with the area of the mouthpiece where the window and table meet. When I was learning sax, back in the day, my teacher would have all sorts of tools to mess with his reeds. Sandpaper, clippers, etc, etc. Most people don't want to do all that to make reeds work. This tool looks like it would do most of the work way easier. Funny you should ask. I asked to have my SOTW membership revoked, just so I wouldn't be tempted to waste any more of my time reading what those knucklehead 'experts' have to say. I have own this tool for a few months now and love it. One of my favorite reed working tools. I keep one with my horn.